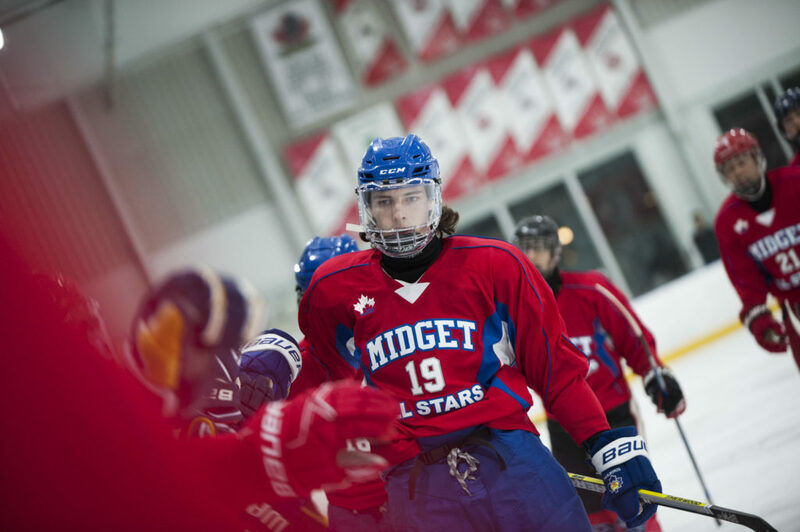 For 18 years, the Midget “A” and “AA” All-Star Games have given Midget-aged players a positive experience to remember their minor hockey years by. With most Midget-age players in their final year of hockey, the event provides a platform for a final sendoff to years spent eating arena hotdogs and long car rides to the rink. Rapos is one of forty “AA” players to be selected to participate in the game on February 5 at Scotiabank Pond. An additional forty players from the “A” division will taketo the ice the day before, on February 4. The game itself is an event many players strive to be selected for heading into their Midget season. The opportunity to play among the best players in the loop is a challenge many players prepare for. Players from the first place Vaughan Rangers (Team Red) will face off against competition from the second place Toronto Aeros (Team Blue). The Rangers have managed to defeat the Aeros in all four meetings this season. Few teams have been able to consistently find an answer to the Rangers, who are 16-2-5 on the season. Seven members of the fifth place Vaughan Panthers will dress for Team Blue. The Panthers currently hold the best record of any team against the Rangers, going 0-1-3 against the first place team. Expect the Panthers to be hungry for the all-star win. The undefeated North York Knights (Team Red) are in the midst of defending their Pro Hockey Life Cup title. The Knights will have eight players representing Team Red, while the second place Toronto Aces will have seven players on Team Blue. Only the Humber Valley Sharks and Hillcrest Canadiens have come close to defeating the Knights this season, each recording ties against the strong squad. The Midget “A” All-Star Game will take place on February 4, while the puck will drop on the Midget “AA” All-Star Game on February 5. Both games will take place at Scotiabank Pond and have a 7:30 pm puck drop. Click here for full rosters.